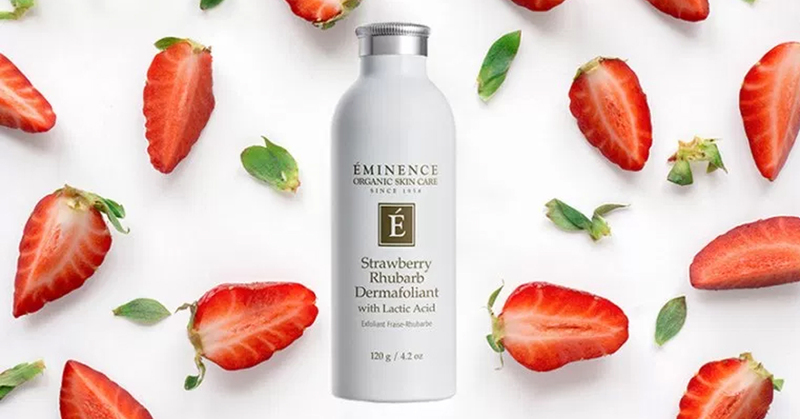 With countless fans, rave reviews and awards, Eminence Organics Strawberry Rhubarb Dermafoliant has earned its status as a skin care staple. Here are three reasons to add this beauty editor, celebrity and makeup artist favorite to your skin care routine. Beauty experts agree that Eminence Organics Strawberry Rhubarb Dermafoliant is the key to beautiful skin. Refinery29’s beauty editors call it the perfect pick to keep skin in tip top shape between spa visits. Westworld star Thandie Newtonswears by it, saying: “Completely natural and organic, smells divine and is gentle enough (but properly effective) to use morning and night.” Celebrity makeup artist Pati Dubroff includes Strawberry Rhubarb Dermafoliant in her skin care arsenal, revealing to NewBeauty that it is a must-have for her A-list clients. This popular exfoliant is infused with natural, organic and Biodynamic® ingredients that work together to cleanse and polish the skin. Organic strawberries containing salicylic acid gently exfoliate and remove impurities to brighten the skin and shrink the appearance of pores. An excellent source of asorbic acid and vitamins, organic rhubarb helps minimize the visible signs of aging for a youthful looking complexion. With the addition of water, Strawberry Rhubarb Dermafoliant transforms into a creamy paste that sloughs away dead cells and buffs the skin’s texture, revealing a smooth, flawless looking finish. It’s no surprise that it’s one of Eminence Organics best selling products.